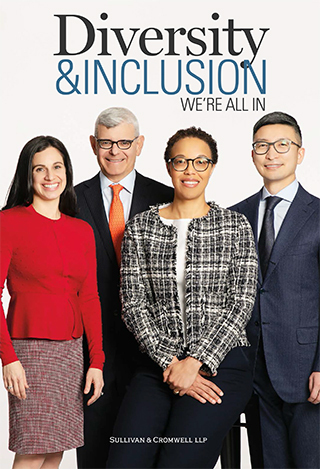 Sullivan & Cromwell is committed to fostering a diverse and inclusive work environment. We believe that diversity is vital to the Firm's ability to provide our clients with the highest level of service. Accordingly, the Firm's culture and policies value the unique abilities and perspectives of every individual and support diversity in its broadest sense, including race, gender, ethnicity, sexual orientation, gender identity, gender expression, disability and religious affiliation. The Firm's Diversity Committee is co-chaired by a member of our Management Committee and the Deputy Managing Partner of the Firm's Litigation department. Other members of the Diversity Committee include the Firm's senior chairman, practice group managing partners, hiring partners, assigning partners, chairs of the Firm's associate affinity networks, and a co-chair of the Women's Initiative Committee. The Diversity Committee – in conjunction with our Diversity Management Department (“DMD”) – is charged with developing, implementing and coordinating the Firm's diversity and inclusion initiatives. Realizing the importance of an integrated approach, the DMD works closely with our Recruiting, Professional Development and Legal Personnel Departments to monitor the effectiveness of our extensive diversity initiatives and programs to further the Firm's mission. In addition, our lawyers have diverse backgrounds; they speak over 40 languages fluently and they come from approximately 40 different countries and 150 different law schools.